Some people asked me often this kind of questions: is there any Chartres transport service if we want to travel around Chartres? Of course, public transport in Chartres is exist! In most cases, traveling by public transport is more effective rather than by own car. Searching for a parking place could be very annoying and costs you more! 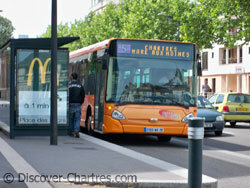 Keep reading to discover the public transport services which you can use while you are in Chartres. Filibus now has 13 bus lines, serve the travelers within Chartres Métropole - from/to Chartres, Lucé, Luisant, Mainvilliers, Champol, Barjouville, Le Coudray, Lèves and Euroval. Many Chartrains use Filibus to reach their work places, to school or anywhere else as daily transports. If you plan to travel more inside Chartres Metropole, it is profitable if you obtain a particular card to get less price than usual. This card called Carte de dix voyages (10 voyages card), usable up to ten times travels to any destination with Filibus, available in Filibus Agency with the price of 9,10€. Swipe this card on a particular machine placed inside the bus every time you get in and you're done! Otherwise, you can buy a single voyage ticket bus directly to the bus driver for 1,10€. Also available some bus card types, depends on your actual situation in Chartres whether you are a student, a Chartres resident etc. Subscribe to bus cards would cost you less than if you buy a single ticket each time you take a bus. Consider this if you plan to stay long time in Chartres. Remember to keep always your ticket or card during your travel as often there is an unexpected ticket inspection. Otherwise you will have to pay penalty which cost 24 to 36 times of a normal ticket price ... oops! You can always bring the bus lines map which are free available in Filibus Agency to easier discovering up your route. Or else you can download directly from their website. Each direct ticket can be re-use as long as you don't exceed 30 minutes time limit. 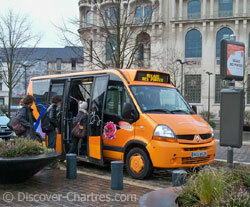 A free Chartres transport service with a specific route - circulation in the city center - Chartres hypercentre. 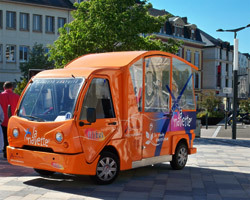 Since April 16, 2012, Navette service goes green - by using an electric shuttle bus. Monday to Saturday from 10.23am - 12.03pm and 2.07pm - 6.01pm. No service on Sunday and holidays. Click here to view the Navette circuit map. Also a free public transport service but this one has a wider route than Navette. Relais des Portes is a daily service (except Sunday) from 6.39am to 7.09pm. This orange colored minibus could take you near to touristic sites, passes every 15 to 20 minutes. Click here to view the Relais des Portes circuit map. Another public transport that connect Chartres and nearby cities like Maintenon, Dreux, or anywhere else exclude Chartres Métropole but within the Eure-et-Loir department.